Seating in a bathroom might be an after thought, but it can be a very functional piece of furniture in your bathroom. Add seating in the form of a chair, stool or bench to give you a place to rest while also functioning as a side table or providing storage. 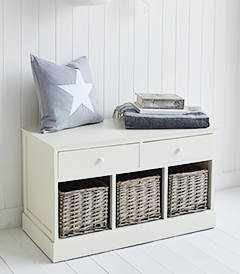 A bathroom storage seat has a double function, hiding away linen, spare towels and toiletries while offering a place of ease. Near the bath, a stool is useful for holding towels, magazines or even a glass of wine as you bathe, while also adding character to you bathroom.